Several years ago I watched a governor deliver a State of the State speech, trying to shore up citizens during a difficult time for the state and the country. That is, until a member of the audience sneezed. 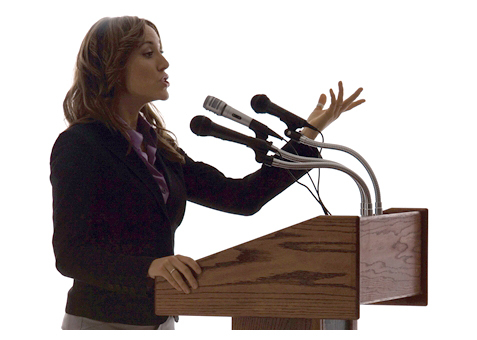 Here are four things speakers should avoid doing from the podium. The sneeze itself wasn’t remarkable. But the “Bless you,” that followed was. Why? Because it came FROM THE PODIUM! While the intention may have been to appear folksy or approachable or even just considerate, the effect went far, far beyond. Instantly, the governor shattered any aura of leadership, reducing our esteemed dignitary to the status of, well, everyone else. Sure, deep down, we know governors and presidents and all public speakers are mere mortals. But when they’re standing before both chambers of the legislature or even just at the front of the room, we assign them special status. In return, we expect them to embrace it. 1) Speaking directly to any one member of the audience. 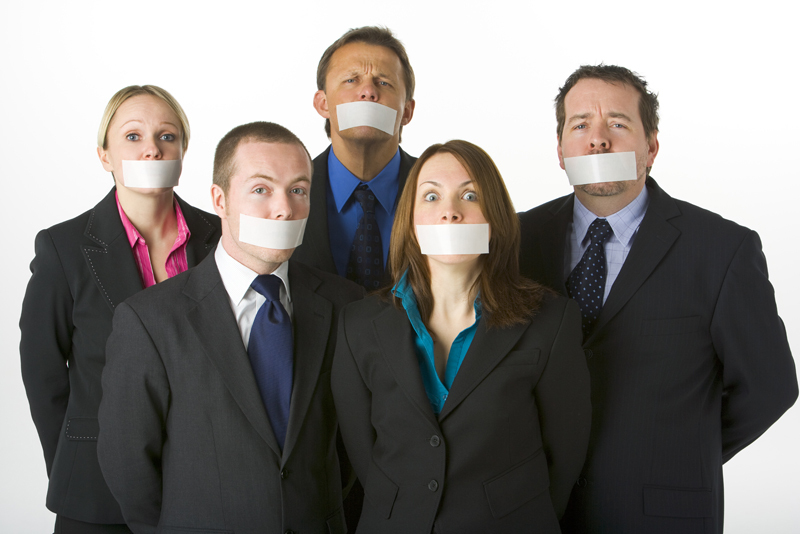 Don’t break from your remarks to acknowledge sneezes, coughing or other bodily functions. For that matter, don’t engage in any conversation with a lone audience member. EVERY audience member is making YOU the focus of their attention. Make sure they feel you’re returning the favor. 2) Clapping. While it’s OK to solicit applause for something or someone from the podium, don’t take part. You’ve done your job by rousing the crowd; now just stand back, smile and look pleased. Not only will you spare the audience the ear-splitting sound of hands clapping into a microphone, you’ll appear more poised. 4) Managing the logistics. It’s the speaker’s job to awe the audience with great content, not to make sure the mic levels are recording-studio-perfect or that seats are re-arranged to accommodate latecomers. Once you begin, focus on engaging the audience and let your host, the AV crew or even another audience member tend to logistical details. If you’ve ever worked with a media trainer or PR person, you’ve likely been coached to identify and then stick to your key messages. This is the fundamental rule of media training--and for good reason. Neither a reporter nor any other audience can reasonably remember more than three or four main points from any conversation. So we organize our thoughts into bundles of three or four messages and repeat those over and over. But here's a media training secret: Most company messages sound a lot alike. It’s true! So while communications teams may be pleased when executives “stick to the messages,” reporters and other audiences are frustrated that they can’t get beyond the predictable, abstract and boring rhetoric they’ve heard time and again. Not only is that bad for the reporter, it’s bad for the executive who will either be quoted saying something forgettable, or more likely, not quoted at all. While all of those are excellent key messages, when they’re used with no supporting points, they seem cliché, trite and hollow. Suddenly, the reporter can picture the executive opening that letter and imagine the grateful customer and the helpful employee and perhaps begin to think, wow, they DO have great people. With catchy phrases like “global company operating like a corner store,” and memorable details like “a warehouse in Oklahoma,” suddenly the abstract message "Our strength is in our people" starts to have meaning and credibility. Though of course they must be vetted first, stories, examples, analogies, metaphors, and snappy one-liners can all serve as powerful message enhancers. And when organized around your three or four key messages, they're almost certain to resonate, be remembered and, with just a little luck, get repeated. If your organization needs help crafting compelling messages and unforgettable message enhancers, give us a call at 248.514.7085. For more great ideas and tips for rock solid communication, check out our blog “Let’s Be Clear," visit us at bluestoneexec.com, like us on Facebook or follow us on Twitter @bluestoneexec. If you're like most professionals, you recognize the impact strong speaking skills have on your organization, your causes and your own career---and you're looking for ways to improve. One of the quickest ways to improve as a speaker is to videotape, playback and critique your own performance. There's one tactic above all others that can help you do that. But if you're like most people you're not going to like it. Here it is: Get out a video camera, put it on a tripod or stack of books and deliver your entire presentation front to end. Then play it back, watching and taking notes on the whole ugly thing. So much of what you need to correct will be so immediately obvious to you (just as it is immediately obvious to your audience) that you can vastly improve merely by recording, watching, reviewing and trying again. Of course, self-critiques are not a substitute for professional speaker coaching. But they can go a long way toward helping you pick up on poor content, a lack of energy, nervous gestures and vocal tics. I know there are plenty of excuses for NOT doing this so let's address a few right here. "I don't have a video camera." These days EVERYONE has access to a video camera. If you don't have a camera devoted to video, use your iPad, your laptop or your phone. "I'm better when I wing it." Trust me, you're not. When you avoid scrutinizing your performance, YOU might be blissfully unaware of your flaws, but your audience is not. "Practice only makes me nervous." This is legitimate and true of most speakers. In fact, the first performance after you critique the video may be worse than the first, as you struggle to make changes. But you will quickly improve. And after a few cycles of taping and reviewing, you'll almost be able to see your mistakes before you make them and avoid them outright. "There isn't time." Consider how much time you typically devote to collecting info, chasing down every last detail and refining your slides or other visuals. Without question, some of those minutes or hours would be better spent on video rehearsal. (Often, the first on-camera take reveals that much of your content ought not to be re-worked, but rather slashed!) Regardless, don't squander the significant time and money you've already invested by skipping this important step that can make all of those efforts worthwhile. Instead, do yourself, your organization and your audience a favor: Get out that camera, find a place to prop it and hit record. Those first few takes may make you cringe. But before long you---and your audience---will like what you see. If you're organizing a program that includes a list of speakers--or even just one--don't underestimate the importance of a strong finish. A few weeks ago a friend invited me to a lunchtime presentation his company was sponsoring to update existing customers and woo new ones. The company obviously had put great effort into a top-notch guest list, menu and lineup of speakers. Which is why I was so surprised by the way they brought the program to a close, or more accurately, didn’t. After an hour-long pitch perfect performance at the worst possible time the program hit a flat note. I wonder how many guests’ opinions of the program—and worse, the company—plummeted in those final few moments. Leaves the audience feeling their investment of time or money was worthwhile, either by succinctly summarizing the program’s highlights or putting them into a broader context. Gets applause. To feel like it’s a hit, your event needs this final burst of emotion and energy. If you can’t think of any other way to accomplish this, at the very least offer the tried and true “Please help me once again thank our panel” to get the crowd clapping and ultimately out the door on the positive note your event deserves. It’s time we have a talk about the apostrophe. As professionals who help executives look and sound their best, we feel a duty to remind professionals everywhere that reckless, irresponsible and incorrect use of the apostrophe is making them appear… well…not smart. In fact, it’s those pesky surnames (whether ending in “s” or not) that seem to give us the most trouble. I think about half the holiday cards that come to our house include an errant apostrophe in either our name or that of the senders. It’s not the possessive “To the Smith’s, from the Ross’s” but rather the plural, “To the Smiths, from the Rosses”---no apostrophe needed. And poor Victoria’s Secret somehow let this apostrophe error make it all the way to the front window of stores nationwide. (Psst, Victoria. It’s “bodies,” not “body’s.”) Hmm. Maybe they don’t think anyone is actually looking at the words. "We Begin Tonight with What's Boring." Newscasters like NBC's Brian Williams know better than to start the show by talking about themselves. Once the shock of his unbridled narcissism wore off, we’d hear “click,” “click,” “click” across the country, as viewers registered disapproval with their remote controls. TV newsrooms have spent decades and billions of dollars researching how to deliver important information in a format that is concise and compelling. They know it’s NOT by starting with what’s boring or by talking first about themselves. For the business presenter, the evening news offers some great lessons on how to verbally communicate information, make key details stick, and keep audiences engaged from start to finish. 2) Respect the medium. A broadcaster covering the same story as a print reporter will get about 1/20th the words to do her job. She can’t possibly communicate the same volume of information. But rather than bemoaning the limitations of the medium, good TV reporters embrace its advantages, using visuals, sounds, vocal tones, even timing to convey a few key points with lasting effect. (Think of how the nation recalls the first man on the moon, the tumbling of the Berlin Wall or even 9-11.) In business, understand that a live presentation is different than a written report and find ways to exploit those differences to your advantage. 3) Don’t forget sports, weather and the lotto. No matter how big the news day, there always will be some viewers who still want the day’s high temp or the baseball scores. In business, no matter how creative or compelling your presentation, someone in the audience may still want to see an industry standard chart or graph. So go ahead and include that. But keep in mind sports and weather usually get just a few minutes toward the middle or end of the newscast---and lotto numbers run during a break. Concede, if you must, some airtime to what people EXPECT to see. But if you want to engage your audience and make your presentation memorable, do what newscasters do: Focus on what’s UNEXPECTED, what’s most interesting and what’s new. A while back I attended a breakfast at which a brilliant economist was slated to share insights on a growing industry segment. The topic was compelling and drew a large and captive audience. Unfortunately, our speaker was only half way through his remarks when eye lids began to droop and heads started to nod. The audience was trying hard to stay tuned in. But our speaker's weighty material, sing-song cadence and thick accent could have lulled the fussiest baby to sleep. As consultants who assist leaders and subject matter experts at global companies, we frequently work with professionals who are presenting in their second or even third languages. I am always in awe of these brave souls. A while back I was at a friend’s baby shower, chatting with the other guests, when it became clear someone should say something to mark the occasion. This was a long awaited pregnancy and these women wanted an emotional outlet, a chance to shed a happy tear and at long last applaud our expectant friend.